Founder of the ensemble „Le Chardon”. Study at the University of Oldenburg (modern flute). Masterclasses with Wilbert Hazelzet, Lisa Beznosiuk and Barthold Kuijken. Hajo played in different orchestras, such as European Baroque Orchestra (UK), Utrechtse Consort (NL), The Northern Consort (NL), Haydn Sinfonietta Wien (AUS), etc.. Worked together with Simon Standage, Roy Goodman, Reinhard Goebel and Jos van Veldhoven. 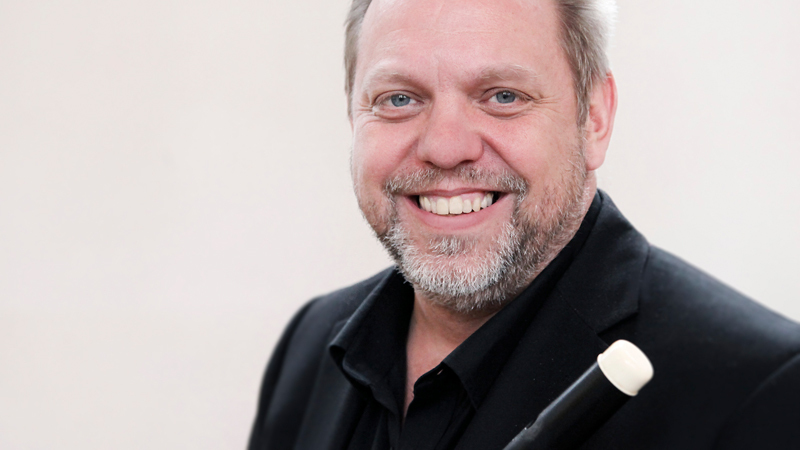 Concerts in radio and TV as soloist and principal flautist in many European and non- European countries (Germany (NDR, SWR, Bayern 4, WDR, Radio Bremen), Spain, England, Italy, France, Belgium, Denmark, Romania, Chec Republic, Poland, Slovenia).. Since 1994 construction of handcrafted traversflutes. Besides his extensive work with his own orchestra, he took part on many recordings for radio stations or CDs as a soloist or as initiator. He edits largely unknown baroque compositions and publishes them. 2007 Hajo founded his own CD company and CD lable. Hajo owns some original flutes by Johann Gottlieb Streitwolf and anonymous flute builders from the early 19th century, he uses them for recording classical and romantical music. Baroque music he performs on a copy crafted by himself. Hajo is docent at Festival Retour. 2014 he founded and since then has the leadership of the Jugend Barock Akademie NRW, a Baroque Orchestra for young people in Nordrhein Westfalen. 1995 CD recording of Simon Heighes´ reconstruction of the St. Mark´s Passion by Bach. 1998 Recordings for Radio Bremen of largely unknown Sonatas composed by the Bach-pupil J.A. Scheibe. Edition of a largely unknown collection of flute sonatas composed by Antoine Mahaut , 1999 at Broekmans en van Poppel in Amsterdam, 1997 CD recording of this collection. 1999: Rudolf Kelber´s CD recording of another reconstruction of the St. Mark’s Passion by Bach in Hamburg. 2000: recording of a Londoner Trio by Haydn at the WDR. 2003: chambermusic CD of wellknown and unknown music by Georg Phillipp Telemann among others with the title "Die Luft ertönt vom Schalle"
2007 CD with works by J.A. Scheibe and M. Clementi, together with Winfried Dahlke. 2008 CD „Bleibt ihr Engel, bleibt bei mir...“ Cantatas and arias by J.S. Bach. Markus Brutscher tenor, Hajo Wienroth traversflute, Mark Baigent oboe. Juni 2009 CD Opera at Esterhàza, Haydn Sinfonietta, Miah Persson, Christoph Genz. 2013 Arias for Tenor with the Europaen Baroque Orchestra Le Chardon, Andreas Post - Tenor. „Mein Alles in Allem”.